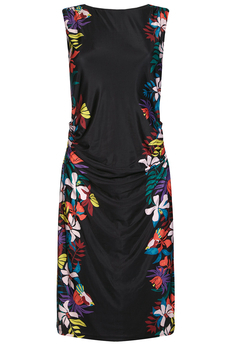 Jungle Floral Jersey dress is a go-to for any occasion. In silky and soft lightweight stretch jersey, this sleeveless bodycon dress has a fitted shape for a flattering figure. Features layered pleats along the waist with a floral print down the front and back. Has concealed back zip fastening, is fully lined and is approx. 102cm in length. Summer collection. Composition: 90% Polyester, 10% Elastane. Color: Black.